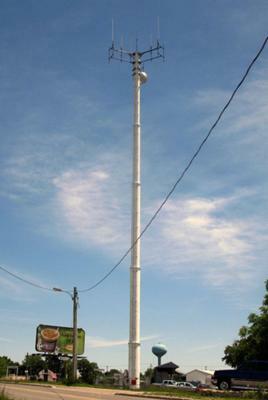 Rogers Wireless 850 & 1900 MHz antennas are located on this monopole in Strathroy, Ontario. Ericsson equipment cabinets just barely visible at the bottom. Comments for Metcalfe St. W.
Yes Derek this one is pretty ugly on the ugly scale. We give it 5 stars. We love ugly monopoles. They all have beautiful cell tower leases.